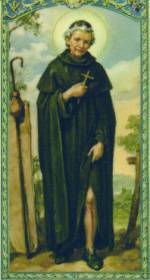 Saint Peregrine Laziosi is known as "The Cancer Saint." Peregrine's father was highly loyal to a political faction that stood in open defiance to the Pope and his mother was loyal to the faith and the Pope. As he grew and matured, Peregrine sided more and more with his father. During a public gathering, he came out of a large croud to strike the visiting Saint Philip Benizi in the face. Over time, Peregrine grew remorseful over the act and as a result started to change his ways. Soon after, he had a vision of the Blessed Mother asking him to enter the Servite Order. Obeying, he devoted the remainder of his life to his faith and, as a priest in Forli, became known as the "Angel of Good Counsel." There were many reports of healings and people being raised from the dead at Peregrine's hands. He later developed cancer in his right leg and was in pain for many years as the cancer progressed. A highly respected surgeon recommeded amputation to save Peregrine's life, but the night before the scheduled surgery, Peregrine had another vision. This vision was of Jesus coming down from the cross with an outstretched hand. The next morning Peregrine was miracuously healed.